Okay, that’s a bold statement and possibly contentious enough to get you to read this but it’s absolutely true. AMERICA’S GOT POWERS launches in April from Image by us, (Bryan Hitch and Jonathan Ross). We told you a bit about it in January. What we hadn’t told you until now was that issue one has THIRTY-EIGHT pages of story and is still only $2.99. Bryan says: “Since I started drawing Ultimates issue one in late 2001, I may have only delivered two or three 22 page books. I’ve always pushed the story either with additional visual material to underscore what’s been written or to pump action to the level we all wanted but would never have had the room for. So I just drew it the way it felt right to do so. Go count the pages in each issue of Ultimates, Captan America: Reborn or FF. Not many 22 page issues. I got hell of course but my deal has always been that giving the story the best work it can have is the only deal that matters. I even did some pages for free to get them in the issues. We have taken stuff out of AMERICA’S GOT POWERS issue one, moved it around and walked around the room whistling. It should have been a 22 page first issue but there were things we felt had to be there and those scenes needed to breath. The story needed to be told properly; it ALWAYS does. So we put it back in and told the story the way we wanted to. Thirty-eight pages of it! Normally a book this size would be at least $3.99 but that didn’t seem fair to us. It was our decision to make the first issue this big and it’s not right to ask you guys to pay extra for it. We are proud of AMERICA’S GOT POWERS, insanely proud and we want to pass that on. We’re just another small business like many of the retailers and we believe completely in the story we’re trying to tell so instead of putting out a 20 page issue and asking you to pay $3.99 for it, we’re giving you nearly DOUBLE that for a dollar less. material is now in a single 38-page issue rather than two separate books. So we ARE still releasing what we intended to in April; the same TWO ISSUES of story but now it’s in one book and only the price of a single. We’re giving you what we said we would but at half the price. 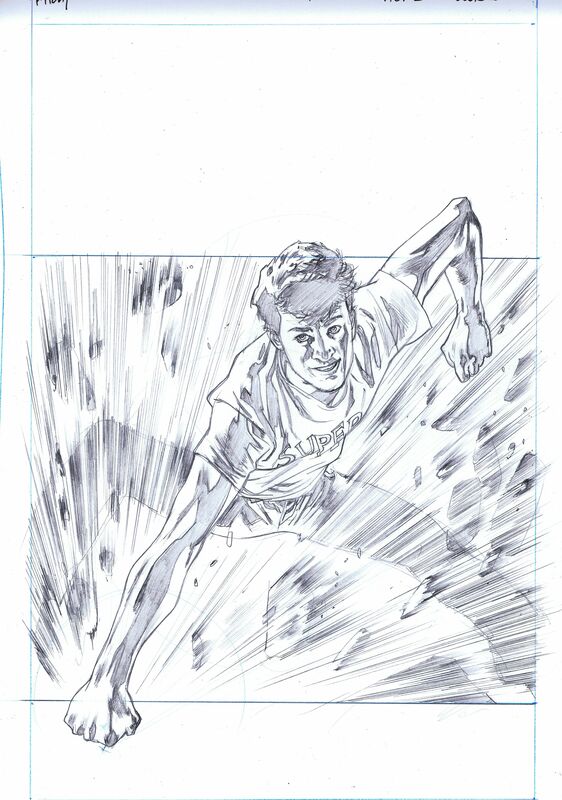 And, to emphasize that boom, here’s a sneak peek at a big boom in a cool two pager from the first massive double-sized issue of AMERICA’S GOT POWERS. 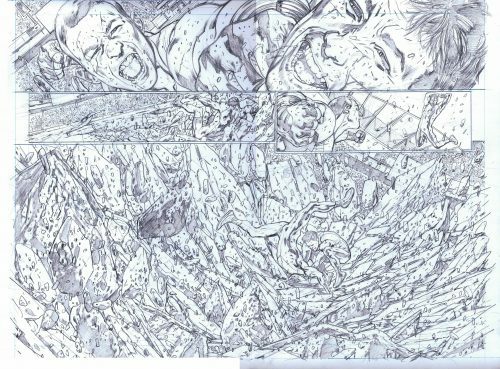 Enjoy the pencils sneak peek. Over the next few days, we’re going to properly introduce you to our characters and the amazing world they live in along with loads of pencils and inks from the first issue to get you excited. Love this, and holy cow spectacular art!